Selenium IDE Tutorial : Learn Selenium IDE software testing tool within 7 days. You can be expert withing 7 days by learning bellow given assignments day to day. You can automate your software web application using selenium IDE if it is not complex. Selenium IDE can helps you to improve quality of your software web application. did not find anything related to write xpath in ext js application..
Hi, i need a help in adding commands to selenium Ide tool. i need to record an action but need to loop it. please help me on this.. While re-executing a recorded transaction the IDE often not able to find the element, what to do for this issue? While re-executing a recorded script the Selenium IDE often not able to find the element again and the test failed, what to do for this issue? I'm new at Selenium too, but it happened to me too before, and I changed the speed of execution, from the highest to the lowest. I hope that works with you too. See once you have recorded a script.save it and after that clear the recorded actions on the Mozilla fire fox and run the script.Again if you wanna run the script clear the screen on the mozilla browser You shud be able to re run it! The thumb rule of automation is that the screen with which we strt the recording,we shud end it on the same screen.Once you have recorded a script,save it and run it.Now clear the screen on Mozilla and again run it.You wont get any error!! Hi I am new to this, can any one suggest me how to proceed with the installation or how to get started with this tool. i am using windows7 professional 64 bit. i need help in getting started with this tool, can any one help me in step by step installation. i have windows 7 professional 64bit using mozilla firefox. I would like to express my thanks for making this website for selenium. 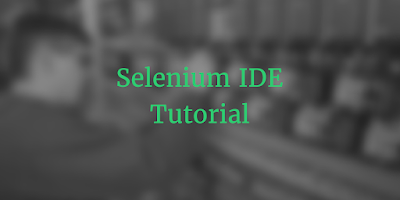 Great, this is very helpful to understand the IDE of Selenium. Thanks a lot for taking a time to share very helpful information. I'd like to give special thank to the author for very useful information.